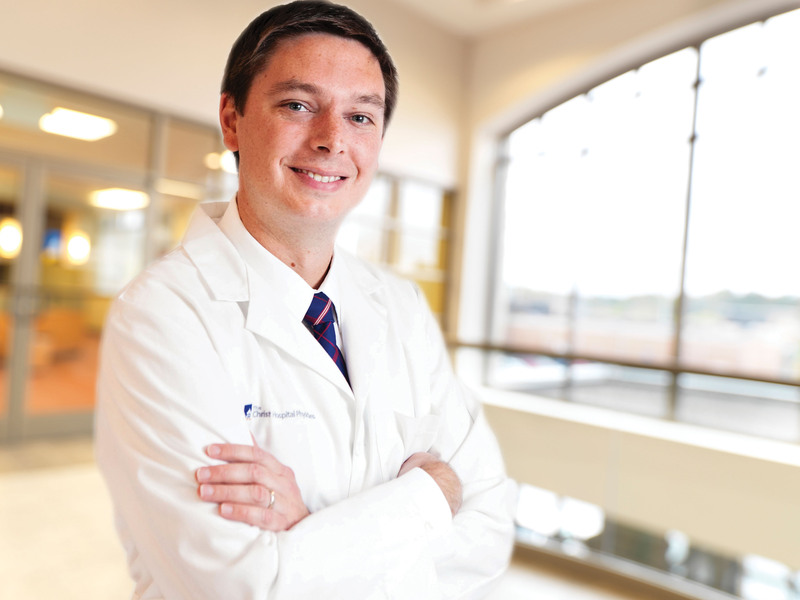 The Christ Hospital Joint & Spine Center is one of the first in the region to offer a brand-new breakthrough in how neurosurgeons treat Glioblastoma (GBM), one of the most common and deadliest types of brain cancer. The Christ Hospital Joint & Spine Center is one of the first in the region to offer a brand-new breakthrough in how neurosurgeons treat Glioblastoma (GBM), one of the most common and deadliest types of brain cancer. Previously available imaging methods, like MRI, fail to detect tentacles of tumor cells which always accompany these GBM lesions, sometimes extending centimeters into important brain regions. A newly FDA approved fluorescence-based surgery allows neurosurgeons to remove as much of the brain tumor as possible, while avoiding damage to healthy brain tissue. Patients ingest a solution (ALA) prior to surgery, which causes healthy brain tissue to appear bright blue and tumors to appear bright pink under a special microscope filter system, Blue 400, developed by Carl Zeiss. The neurosurgeon can see and remove as much of the tumor as possible, without sacrificing healthy brain tissue. Mark Magner, MD, neurosurgeon at The Christ Hospital Joint & Spine Center, is leading this revolutionizing new technology, having treated his first GBM patient with Blue 400 fluorescence-based surgery on January 7, 2019. The Blue 400 is currently available to all neurosurgeons with medical staff privileges at The Christ Hospital. The Blue 400 is one of many advanced technologies available at The Christ Hospital Joint & Spine Center. “We are excited to offer the fluorescence-based surgery as this technology allows our neurosurgeons to provide even more precise neurosurgical care. Technology of this type is the future of neurosurgical care. We are thrilled to be one of the first in the region to provide our neurosurgeons with the technology,” said Herb Caillouet, Executive Director of The Christ Hospital Joint & Spine Center. There are currently trials underway investigating how fluorescence can be utilized to treat other types of cancer as well. About The Christ Hospital Health Network The Christ Hospital Health Network is an acute care hospital located in Mt. Auburn with six ambulatory centers and dozens of offices conveniently located throughout the region. More than 1,200 talented physicians and 6,100 dedicated employees support the Network. Its mission is to improve the health of the community and to create patient value by providing exceptional outcomes, the finest experiences, all in an affordable way. The Network has been recognized by Forbes Magazine as the 24th best large employer in the nation in the magazine’s “America’s 500 Best Large Employers” listing and by National Consumer Research as the region’s “Most Preferred Hospital” for more than 22 consecutive years. The Network is dedicated to transforming care by delivering integrated, personalized healthcare through its comprehensive, multi-specialty physician network. The Christ Hospital is among only six percent of hospitals in the nation to be awarded “Magnet” recognition for nursing excellence and among the top five percent of hospitals in the country for patient satisfaction. For more than 125 years, The Christ Hospital has provided compassionate care to those it serves.